Founded in 1933, The Monorail Manufacturers Association, Inc. (MMA) is an independent incorporated trade association affiliated with the Material Handling Industry. 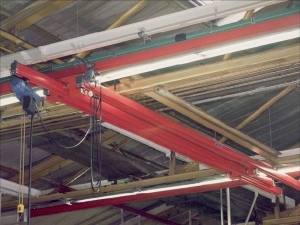 MMA Members produce the preponderance of patented and enclosed track underhung cranes and monorail systems. MMA operates through committees with programs and policies reviewed and adopted by the membership with representation from each member company. Its many activities include an active engineering committee. MMA is represented on a number of standards developing committees and actively supports the development and certification of safety standards by the ANSI consensus method. 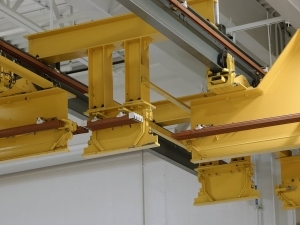 MMA is recognized as a leading authority and a principal resource in the overhead material handling industry. 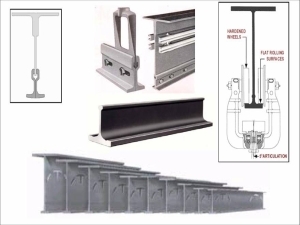 MMA is recognized as the leading advocate for the safe application and operation of enclosed track, patented track and automated electrified monorail equipment, systems and related products. Delivering superior value in our products and services. Providing products and services that are safe and productive. Providing high value solutions directly or through knowledgeable and expert channel partners. Providing an environment in which our customers can confidently purchase and derive superior value from our products. 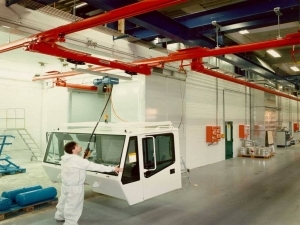 What is the value of membership in the Monorail Manufacturers Association (MMA)? Why should your company join and participate in MMA? What is the Commitment to Join? 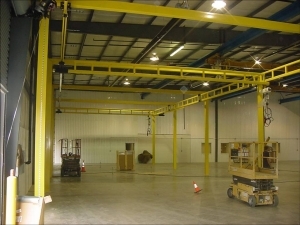 Are recognized as the Leaders in the design, manufacturing, and supply of Workstation Cranes and Patented Track Systems. Engage in the development of ANSI technical specifications that promote consistent design, manufacturing and installation of their products. Collaborate with OSHA through the OSHA Alliance programs to promote the safe use of their products. 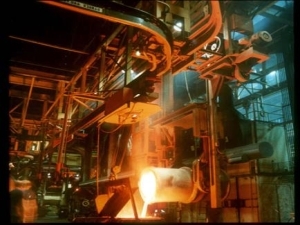 Have extensive experience in many applications and can solve your material handling problems. Are subject matter experts in the industry. A nationwide event to raise awareness and understanding of the value of safety and health programs that include management leadership, worker participation, and a systematic approach to finding and fixing hazards in workplaces. Since 2012, OSHA has partnered with the National Institute for Occupational Safety and Health and National Occupational Research Agenda (NORA) - Construction Sector on the Fall Prevention Campaign to raise awareness among workers and employers about common fall hazards in construction, and how falls from ladders, scaffolds and roofs can be prevented. 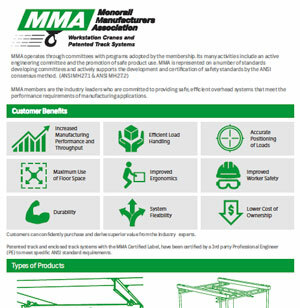 The product guide below will give you an introduction to cranes and monorails as well as MMA members who manufacture these systems.